Greetings from “Big Ditch”! That is what the name of my home town means in Spanish! I live on California’s Central Coast in beautiful San Luis Obispo County. I enjoy movies (more so, it seems, than a lot of people i run into), love natural history, am the proud owner of 5 6 tattoos, and am a nut for ancient warriors. I love paleontology, the study of fossils and ancient life, and have ever since i laid eyes on that stuffed woolly mammoth in British Columbia. 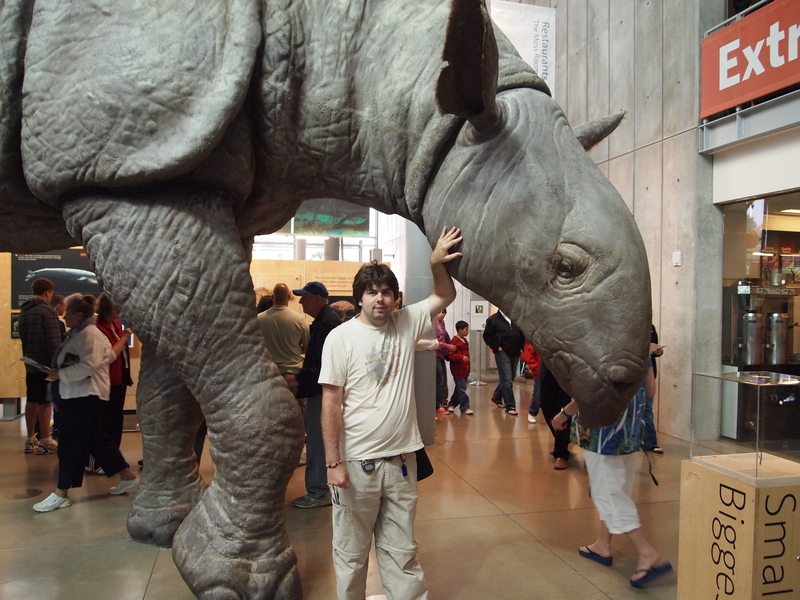 While dinosaurs hold my interest, it is prehistoric mammals whom i love most. The title of my blog is misleading: I’m am not officially a paleontologist. I am currently clawing my way through community college in the hopes of transferring to a real college to get my degree. But i have spent loads of time going to museums, have spent 55 hours prepping a mammoth skeleton, and have even found a fossil or two. While i will post on fossils, archaeology, Central Coast life, and occasionally movies, i created this blog to chronicle my pursuit of a rather ambitious dream of mine. But you can read all about that on the “Grand Vision” page. I will do profiles of the beasties who once lived here, but don’t expect anything too in depth (there are people who can do that much better than I). I will also talk about local geology, things here on the Central Coast (the little things that have their own charm), fossils localities, and sometimes just go on a mindless rant. So with that said, I hope you enjoy my little corner of the infinite interwebs! thanks!Yeah, my flickr pics sure get around. Hey accpaleo. Just wrote a note on your post about the Buena Vista Museum. For some reason I never looked at the title of your blog. Then I noticed it in the list of saved “favorites” on my computer. A Cental Coast Paleontologist. Me too – as a fellow ametuer. I live in Santa Margarita not far from SLO. I too am interested in prehistoric mammals. Mostly I dream about what life would have been like in prehistoric times. Beautiful, full of adventure, and peaceful. I’ve been focusing on the Barstovian. I’ve also done a lot of hiking here. In my hiking career I’ve found some fossils. Not a lot but a few. Most of them are marine. Anyway drop me a line if you want and I can tell you a few places I found fossils here if you don’t already know them. many thanks for the compliments! I will certainly keep you in mind. The museum i hope to start someday is meant for guys like us! accpaleo – First-time visitor here (directed from Switek’s Site). You mentioned in an entry that you were looking for geologic map sources. I apologize if you’ve seen this already, but here is a good one with – now – a few Central Coast maps: http://www.consrv.ca.gov/cgs/rghm/rgm/Pages/preliminary_geologic_maps.aspx If you haven’t seen it, I hope it helps out. Good luck to you. i do have those, but no need to apologize- the thought is always appreciated. Unfortunately, my learning disability has rendered me unable to distinguish between all the colors. how so? any suggestions? thanks! U have a great blog over here. I just wanna thank you for all the interesting stuff on it. I’ll follow your website if you keep up the good work! After examine a number of of the blog posts in your website now, and I really like your way of blogging. I bookmarked it to my bookmark website listing and will be checking again soon. Pls check out my web site as properly and let me know what you think. Greetings from another SLO country paleo student! Love the blog-bookmarked! Hi again accpaleo. I’m the Ron R. who posted above. Just thought I’d mention that I’ve written a novel about a visit to California’s prehistoric past, the Luisian stage (named after San Luis Obispo). Here’s my blog about it (if you don’t mind some shameless self-promotion. Hi there. Great blog! Love your passion. I too am an enthusiast, but not nearly as educated as you. My name is Kari Jagodzinski. I live in South Dakota. I found you while doing a search on gompetheriums. Dear friends of mine (he is a geologist by trade) have a partial skeleton in their collection. They purchased it so they could have much needed preservation work done on it. They are at the age where they would like to find a new home for it where it will be properly preserved, preferably in display so more people can enjoy it. The current owners wish to work through me for security purposes (they are elderly and partially disabled).